Also £39.99 @ John Lewis, click & collect. There's no need to sit close to your Xbox One console with the Microsoft Xbox One Wireless Gamepad, thanks to its wireless capabilities. Plus, with Windows 10 integration you can also use the gamepad to play games on PCs, tablets and smartphones. With up to twice the wireless range as previous controllers you don't have to worry about losing sync with your Xbox One or Windows 10 device. This gives you the freedom to sit where you want when gaming, so you're comfortable for those in-depth sessions. Download the Xbox Accessories App and remap your Gamepad's controls to suit your own personal gaming style, putting you completely in control. Damn never seen these out to buy sunday when I was there getting the volcano controller or I'd of picked one up. Missed picking this up on Friday, got one ordered today Cheers OP. Anyone recommend a play and charge kit to go with it? 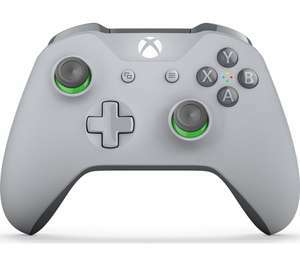 I would say unless you are going to be doing marathon gaming sessions and really need to be able to plug in your controller to keep playing, forget play and charge and get an energiser charging stand. I would say unless you are going to be doing marathon gaming sessions and …I would say unless you are going to be doing marathon gaming sessions and really need to be able to plug in your controller to keep playing, forget play and charge and get an energiser charging stand.